What’s the strategy – not living in the DRC? (sorry, too soon). But seriously, it sounds like a rock band or something. You don’t see key words/phrases like that every day. Or ever? How old is the Acheulian tool industry and why does it matter? Two views of an Acheulian handaxe adorn the cover of this week’s Nature (right). Always happy to see paleoanthropology stuff be classy, front-page news. The cover highlights Christopher Lepre’s and colleagues’ announcement of what may be the oldest Acheulian tools known. To recap stone tools: The first good evidence of tool use by humans’ ancestors are the Oldowan lithics from the 2.6 million year old site of Gona in Ethiopia (Semaw et al. 2003). McPherron and others (2010) reported 2 possibly-cut-marked animal bones from the 3.4 million-year old site of Dikika; but this latter evidence is a bit too scant for us to really be sure our ancestors had adopted technology this early. Anyway, the Oldowan was a very basic tool industry, consisting largely of crude flakes taken off cobbles. It may sound lame, but even the most basic stone-tool-making requires some skills, trust me, it’s kinda hard. So stone tools appear roughly 2.5 million years ago, which is also about the time that we have fossils that might document the earliest members of our genus Homo. Sweet. The legend goes that the next technological revolution doesn’t come until about 1 million years later – until around 1.5 million years ago, stone tools were quite basic. But after a while we start seeing these “handaxes” or “bifaces” (cuz flakes are removed from both of the core’s faces; see above) that have become kind of the hallmark of what’s termed the Acheulian industry. I’m sure there are other key indicators but what do I know, I’m not an archaeologist. Arguably, the rise of the Acheulian from its humble Oldowan beginnings is a milestone in human cognitive evolution – a more complex tool should require a more complex brain, right? Lepre and team announced today that they have some Acheulian handaxes from the Kenyan site of Kokiselei-4, dating to 1.76 million years ago. The authors draw two conclusions: 1) the Acheulian (and thereby more advanced cognition) is a few hundred thousand years older than previously thought, and 2) the co-occurrence of Acheulian and Oldowan tools at this time indicates the presence of contemporaneous human species with different cognitive capabilities. “Leakey recognized two distinctive industries, Oldowan and Acheulian, from Bed I through Bed III at Olduvai. The former was characterized by the presence of various choppers and attributed to Homo habilis sensu lato, whereas the latter was traditionally defined to contain bifaces more than 40-60% of the tools, and attributed to H. erectus sensu lato. “Homo erectus is traditionally thought to be the first hominin to disperse from Africa, yet the oldest known out-of-Africa fossil hominin sites lack stone tools or preserve only Oldowan-style artefacts. … Our data indicate that the earliest development of the Acheulian occurred in Africa at 1.76 [million years] ago and was contemporaneous with or perhaps pre-dated the earliest hominin dispersals into Eurasia (Lepre et al. 2011: 84). They then go on to suggest that two contemporaneous species lived in Africa in the early Pleistocene – one of these species invented the Acheulian and stayed in Africa, while the other species was too dumb to make anything beyond Oldowan, and instead these dullards left Africa to colonize the rest of the world. This silly scenario seems to stem from an under-appreciation of what Dmanisi demonstrates (possibly since the recent dating paper by Reed Ferring and others only came out a few months ago, probably after the Lepre et al. paper was in press). 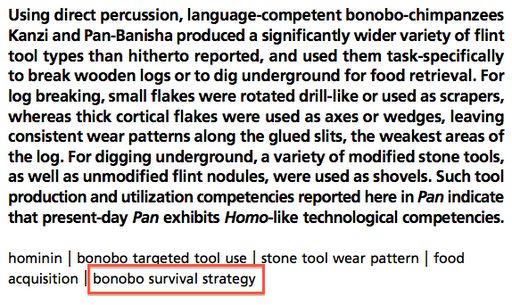 The Dmanisi fossils establish that hominins more primitive than later Homo erectus (Rightmire et al. 2006) had dispersed into Eurasia by around 1.85 million years ago (if not earlier), with mere Oldowan technology (Mgeladze et al. 2010, Ferring et al. 2011). So Lepre et al.’s claim that the earliest Acheulian “was contemporaneous or perhaps pre-dated” the first out-of-Africa dispersals just isn’t true. And without that, there’s no support for the silly scenario of a smart, techno-savvy but stationary species being contemporaneous with a colonizing but less crafty-and-cunning species.